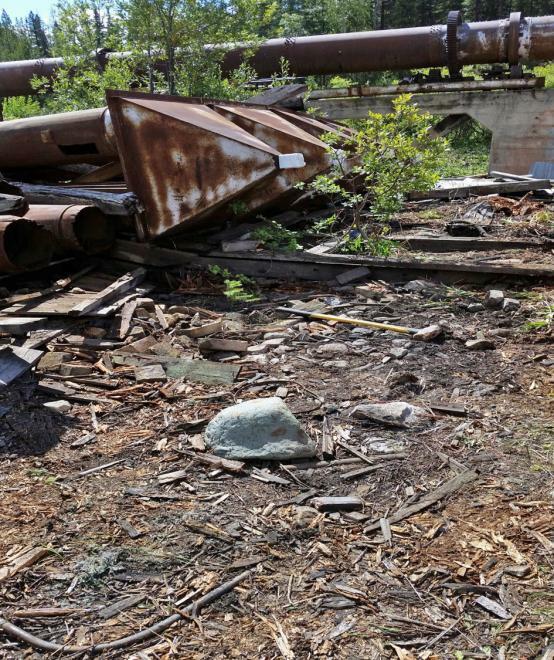 Surrey, BC – An active gypsum manufacturing facility discovered they had a large area of gypsum waste containing asbestos mixed with soil at the back of their property. The waste had accumulated over the years before the dangers of asbestos were known and now required remediation due to communication wires buried in the waste. Excavators could not be used due to the presence of the communication wires that could not be disrupted. Enviro-Vac was asked to provide a solution. Before cleanup of asbestos-contaminated soil could commence, a comprehensive risk-assessment and exposure control plan were developed which required in part, an evaluation of the contaminated ground cover and included, numerous soil samples to determine the type and concentration of asbestos and presence of other potentially harmful compounds within the soil. Additionally, an evaluation was required to determine the depth of the soil contamination and formulate a safe scope of work that would not cause asbestos or other contamination present to become air-borne since removal of asbestos ground cover and ground can pose a significant risk to air quality if not properly removed. Working with the clients Environmental Health & Safety department and engineering staff, Enviro-Vac developed a suitable plan to meet the necessary schedule, safely and on budget. Enviro-Vac developed procedures for asbestos abatement and removal of contaminated ground and utilizing diesel powered industrial vacuum loaders with self contained automated baggers, removed approx six feet of soil for a total weight of approx 250 tons. Contaminated soil was bagged in super sacks and safely disposed of. As the work area was highly visible to the public all abatement work was done underneath a specially erected shrink-wrap containment installed by Enviro-Vac. Enviro-Vac's use of HEPA vacuum loaders for decontamination of facilities and plants has been a trademark of the company since 1976. Contaminated blast media conveying, extraction by vacuum, industrial cleaning of dust collectors and baghouses, hazardous waste remediation and other services for hazardous and non-hazardous material handling. Enviro-Vac has provided solutions to organizations of all sizes for an endless number of diverse applications. For over twenty-five years, Enviro-Vac have set the highest standards for reliability and "on budget - on time" performance in a variety of industrial and specialized markets.